Grow this cheery, old-fashioned favorite at the front of the bed, where its bright white clusters of flowers dazzle in the sun by day and glow in the moonlight by night. Iberis is perfect for spilling over the edges of sidewalks and pathways, for its diminutive stature makes it a most kempt and polite little flopper. Glossy, dark green foliage remains attractive all season if plants are sheared after flowering. 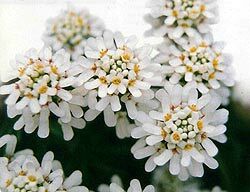 An evergreen, Iberis benefits from a winter mulching of marsh hay. Grow candytuft in full sun in soil of poor to average fertility—this tough little plant has retained a bit of a weed gene, meaning it’s a good choice for spot-planting in ditches and naturalized areas where you’re not all that interested in amending the soil. It also prefers neutral to alkaline soils, another reason not to fuss with the soil. Soil must be well drained, however, or plants can be susceptible to root rot. Anything short of untreated clay soils should suffice, however. Plants will need regular weekly watering in drought and intense heat, and mulching the soil around plants is highly recommended. I. sempervirens is a spreading evergreen that grows 6-12” tall and spreads 16-36” displaying profuse mounds of tiny, white flowers for up to four weeks in mid-spring. It’s a great edging and rock garden plant. ‘Autumn Snow’ bears flowers in spring with a second bloom period in fall. ‘Little Gem’ is a compact, spring-flowering plant that spreads only 10”. ‘Snowflake’ is a taller, wider, mounding plant that bears larger, white flowers in spring. As stems spread outwards, they may root where they touch the ground. Once you get several plants established, you can cut these rooted ends away from the central plant and plop them in elsewhere. Too often gardeners get suckered into buying and growing perennials with vibrant red, blue, purple, orange and yellow flowers, forgetting that white is not only a color, it is as eye-catching and essential to the garden as any. White is the only color you get with Iberis, and that’s perfect.